Board mulls hearing on Upper Green dam. Water commission not convinced reservoir idea would fly, but may consider public views. By Noah Brenner. Jackson Hole News and Guide. Aw the power to stupid ideas. That have such vitality! Like most proposals for new irrigation dams in the West, the economics are horrible. The environmental and pecuniary costs very high and the economic benefits very low. 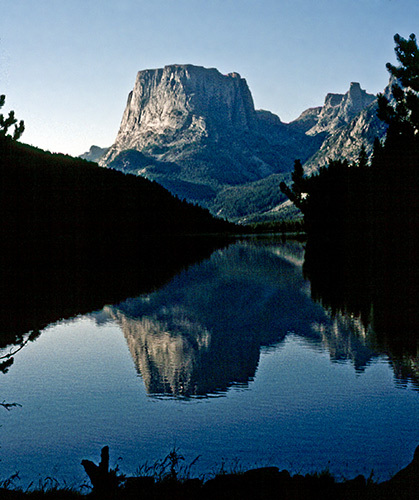 Green River Lakes is regarded by many as perhaps the most scenic view in Wyoming and the upper Green is perhaps the best remaining moose habitat in a state that is rapidly losing its moose. Ralph, please explain where this potential dam would be located. I assume it would not back water into the wilderness but would be located on BLM & FS non-wilderness lands? This is another potential assult on reason, more of the “holocaust” of energy & urbanization development.. Does anyone know who this Dan Budd character is? What’s his angle? Wy are the moose disappearing in Wyoming? There have been quite few reports on the decline of moose NW Wyoming the last couple years from biologists in the field. I’ve posted some of the articles. They seem to be starving due to the drought. Well, by golly, if the moose are already “starving due to the drought” anyway, then we might as well drown their remaining habitat and get it over with. It is Wyoming after all. I bet Paul Hoffman and the city fathers in Cody would want to see a dam built, any dam, any dammed old place. Who gives a dam as far as the good people of Wyoming are concerned. Ask Marion, she’ll tell you! The drought seems to be causing a variety of problems. Maybe this will finally be the year? Just what we need, another dam! I guess I was wrong when I thought that era ended when Floyd Dominy went away. It’s hard to describe the location without a map, but the dam would be built fairly high up on the Green above the US 191 highway bridge between Jackson and Pinedale, possibly as far up as the big bend of the Green. Perhaps Ralph has a map he could post. No place is geologically suitable for a dam, and as the story mentions, the cost of the necessary construction for canals and ditches would certainly not be met by irrigation fees. It certainly isn’t needed, even from an ag perspective. On the other hand, it would be a great subsidy for the Budd family. Dan Budd is an old, obsolete rancher who’s about as far right as you can get in Wyoming without falling off the edge of this flat earth. He’s also the father of Karen Budd-Falen, the notorious “county movement,” “Sagebrush Rebel” attorney in Cheyenne and Bob Budd, former President of the Stockgrowers, manager of Red Canyon Ranch near Lander (owned by the Wyo. Nature Conservancy), and currently ED of the Wyoming wildlife trust board. Bob is somewhat to the left of his father and sister. Putting a few names to the proposal certainly clarifies things ! If there is interest I guess I could post a Google Earth capture. There is no real canyon like you expect with a good dam site, just a fairly narrow, in places, river valley. I might add that the Upper Green is one of the few remaining major migration routes for big game, chiefly pronghorn, in the lower 48 states; it is also the longest route in the lower 48.